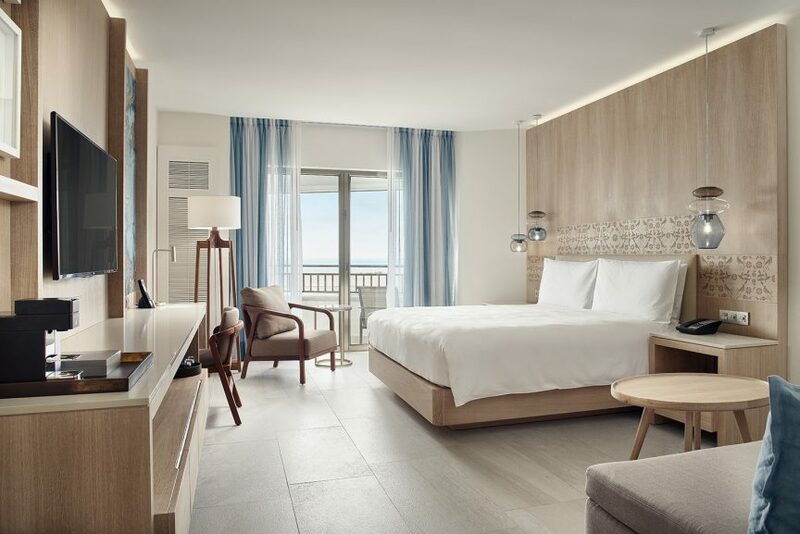 JW Marriott Cancun Resort & Spa has completed a multi-million dollar restoration that transformed all 447 guest rooms and suites and introduced modern elements with Mayan flair. The interiors of the hotel were re-envisioned by Martha Gaos and Claudia Gonzalez of G+G Interiorismo and now feature warm sand tones with pops of bright turquoise, to reflect the Caribbean waters. The hotel is furnished with pieces that tie in traditional Mayan designs like Mexican textiles and reclaimed wood accents with carved drawings which pay homage to cross-stitched embroidery work by the ancient Yucatan people. Intricate designs are embellished with native, meaningful symbols. Other local elements can be found throughout the interiors like the herringbone-patterned floors, which were created by local artisans and aerial-view images of Mexican cenotes, which can be found in the room’s bathrooms. An indigenous type of wood was used in the redesigned suites along with other finishes reminiscent of coral reefs. Additional renovation highlights include modern, oversized bathrooms with freestanding soaking tubs, luxurious rainfall showers, dual sinks, and granite vanity tops featuring chrome detailing that deliver an elevated look and feel. The exclusive Club 91, located on the 14th floor was also updated with new decor, new interactive culinary experiences and open communal table concepts. Guests will find new navy blue and olive-hued chairs and coral reef ceiling decor. Even the menu at the JW Lobby Bar received a new twist from the team’s expert mixologists and tequila connoisseurs. The new 150 Margaritas menu features 150 Instagram-worthy margaritas subdivided into four categories: classic, modern, fusion and exotic. Cocktails are crafted with silver and añejo varieties of tequila, as well as mezcal and special ingredients like black tea, beetroot and serrano chili peppers. Rates start at $409 per night. Valid for bookings through March 31, 2019 for travel now through December 21, 2019. Use code E0Q when booking.